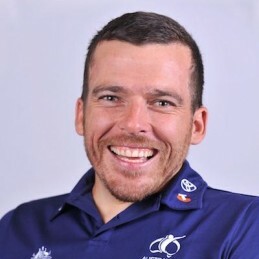 Raised in the small country town of Carcoar, Kurt Fearnley has always been determined. Being born without the lower portion of his spine has never held him back, from backyard games of football to crawling along the Great Wall of China, he always has a go. Turning his attention to wheelchair sports in his teens, Kurt quickly became a world beater. Kurt started his career with two Silver medals at the 2000 Sydney Paralympic games, before making his winning breakthrough at the 2004 Athens Paralympics with Gold in the 5000m and marathon races. Following the 2004 games, Kurt conquered the world, winning seven world championships and more than 20 marathons around the globe, including 10 marathons in 2007 and three straight New York marathon titles. He solidified his standing as a Paralympic great by defending his Gold medal at the Beijing Paralympics and continues to excel over a range of distances on both the track and road. At the London 2012 games, Kurt won Silver on the track and again finished in the marathon reckoning with a Bronze medal result. In 2009 Kurt crawled Papua New Guinea’s Kokoda Track and was a member of the 2012 Sydney to Hobart Yacht Race winning crew aboard Investec Loyal. Kurt is a passionate disability advocate and devotes himself to a number of national and Hunter-based charitable initiatives. He is a member of the Independent Advisory Council of the National Disability Insurance Scheme, a board member of Australian Volunteers International and a Council Member of the NSW Australia Day Council. As a qualified Physical Education teacher, Kurt travels throughout NSW teaching high-school children in small and large communities. Kurt’s exploits both in and out of sport saw him recognised as the 2009 NSW Young Australian of the Year. Kurt is now in demand as a inspirational and motivational speaker, with his over all theme of over coming adversity and achieving any goal you set your mind to.